Fatsias are invaluable in our climate for their tropical good looks, and overall hardiness. They endure dry shade with aplomb and in autumn they explode into exotic bloom with large stems supporting orbicular white flowers. This cultivar has leaves with an interior zone of yellow. 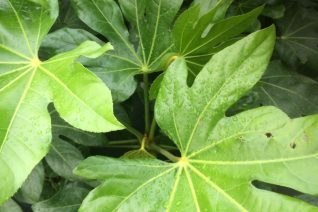 Slower growing than the species it will eventually top out at 6′ x 6′ in full to part shade in rich well drained soil. Light summer water. Moderate deer resistance. Cold hardy and very easy to grow. Not easy to find this is a most regal evergreen shrub. 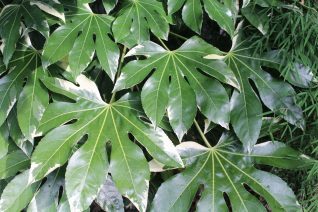 The large palmate leaves are emargined in splashes of white. 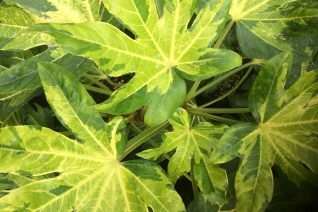 In autumn the large candleabra like flowers structures are themselves variegated white. White orbs of flowers at the tips. To 8′ x 8′ in 7 years. Full shade to part shade in average to rich well drained soil. Adapted to dry shade. Drought adapted but tolerates regular irrigation. Fast growing. Variegation becomes more conspicuous as this shrub ages. Moderate deer resistance.